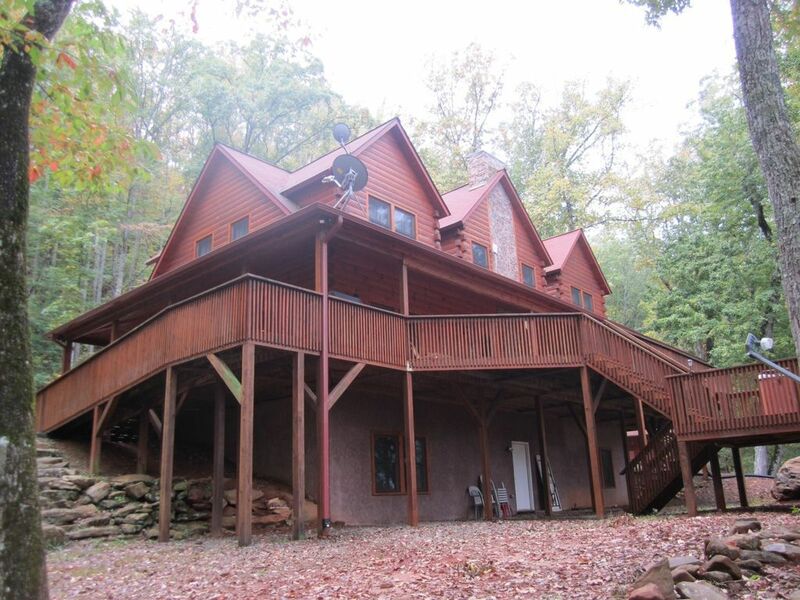 This beautiful log home is located on five wooded acres with a great view of the Smokey Mountains. 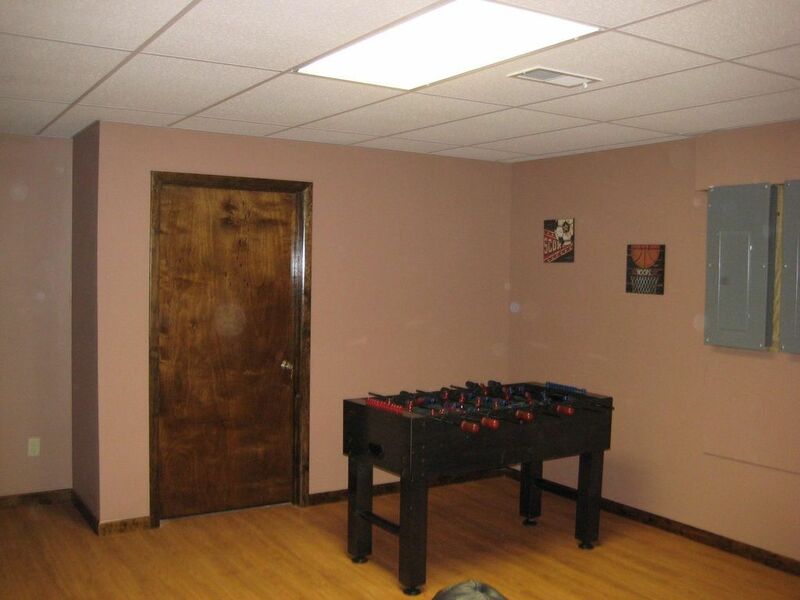 The 4,300 sq ft, three floor interior contains: 7 bedrooms, 5 baths, and a game room in the basement. 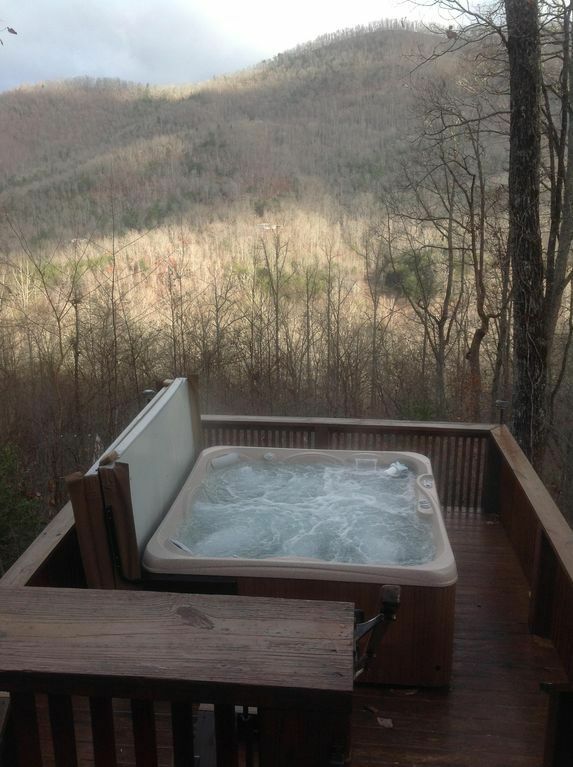 Magnificent mountain views can be savored from the spacious, wrap around, covered deck which also houses a hot tub. 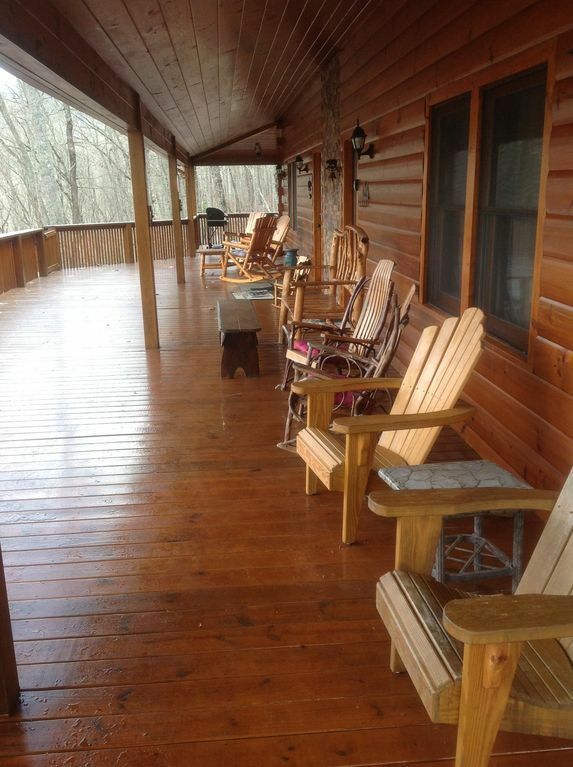 In addition, the deck and main level have wheelchair access. 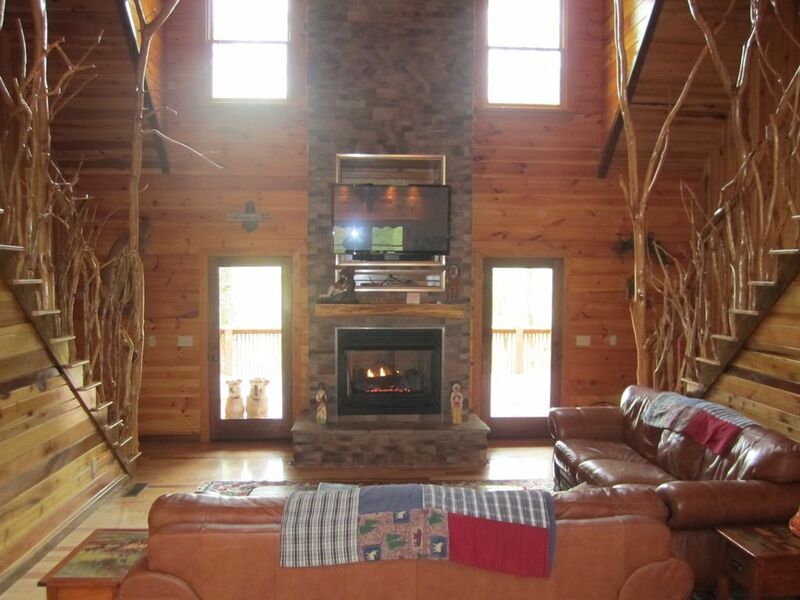 The cabin is completely furnished and contains all the amenities necessary to improve your vacationing experience. 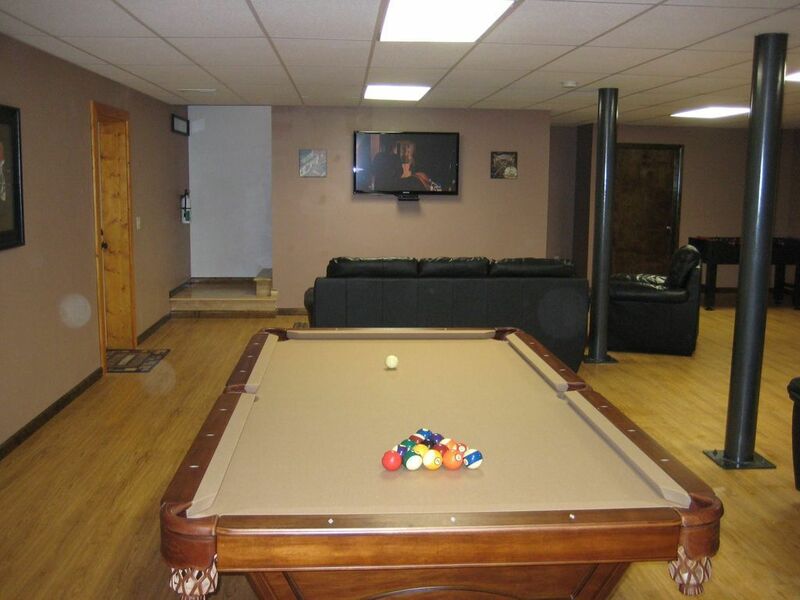 Some of these amenities include TV’s in almost every room, barbeque grill, and fire pit among other things. 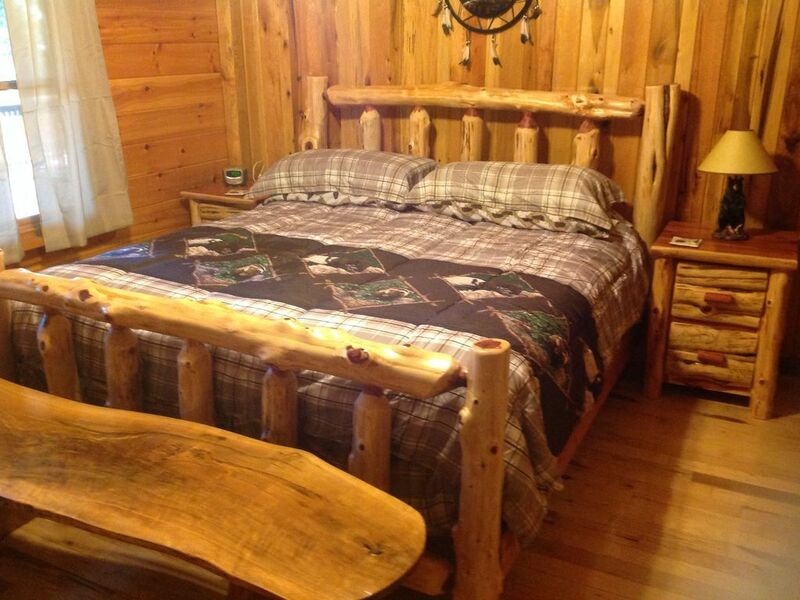 The two master suites both contain custom king beds and 32” Flat screen TV’s. 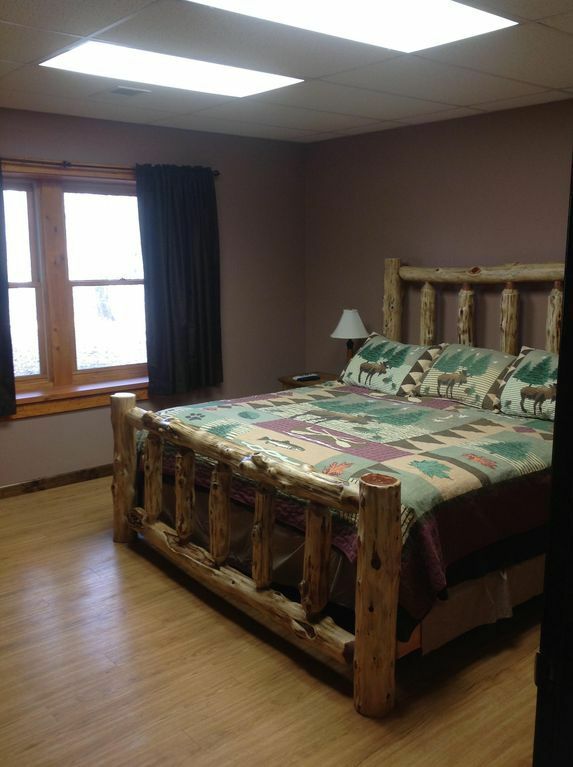 There are also two more king bedrooms on the main level along with two bedrooms with a full and twin beds in each room. One of the most unique features you’ll notice as you step into spacious interior is the custom handmade railing leading to the master suites. 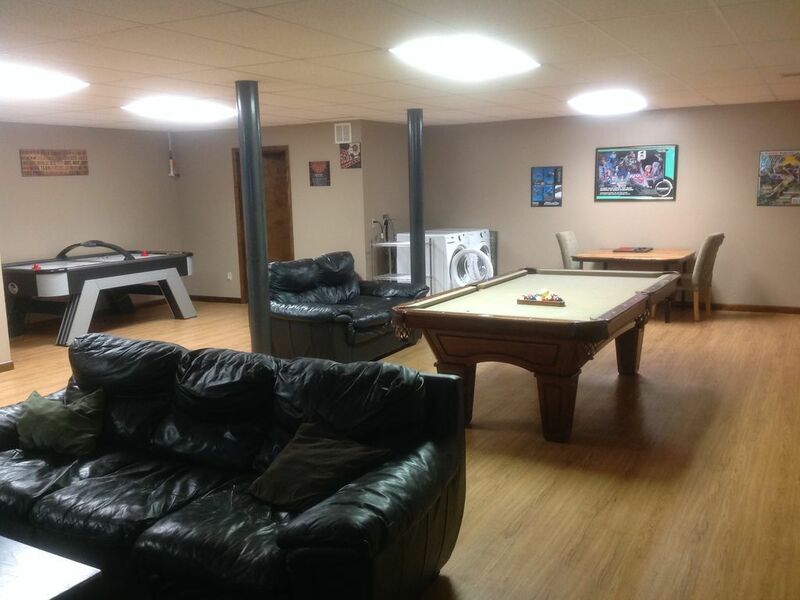 When you step down into the basement game room, you will find a 8’ pool table, air hockey table, Foosball, 51” plasma TV, leather couch, loveseat, oversized chair, and ottoman. 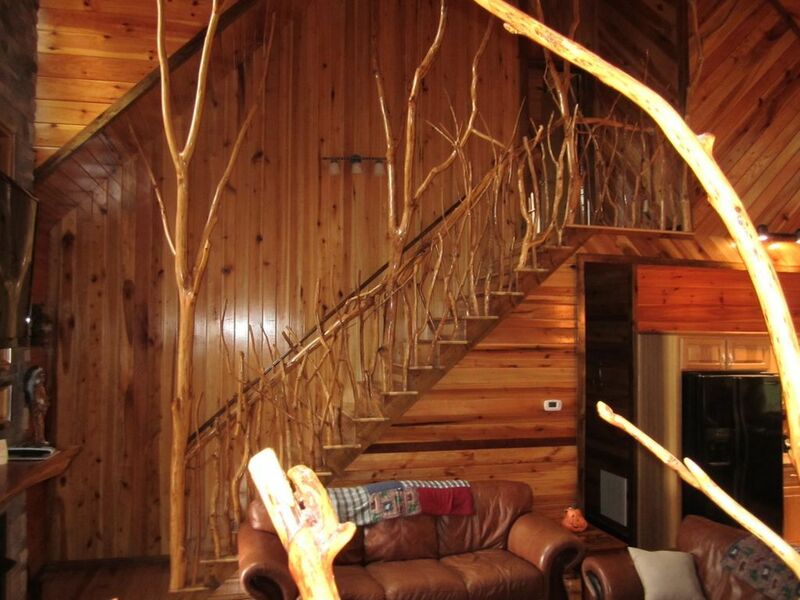 All of these details have been taken care of to insure that you will have a great time at Archar’s Lair. A 2 night minimum, with a three night minimum on all Monday Holidays. The summer time require week rentals(June thur August). There is a one week minimum for Thanksgiving, Christmas, and New Years weeks. 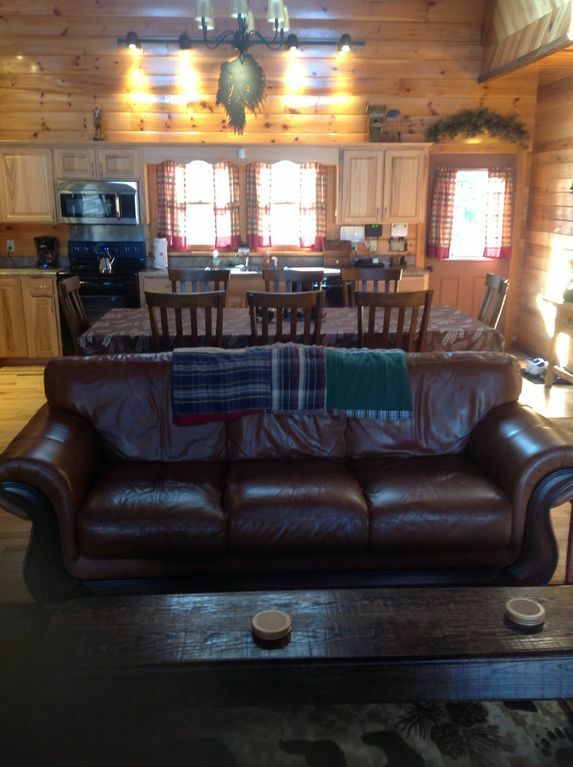 Super Bowl week requires a week rental. Cancellations on Holiday weeks require a 60 day notice for full refund, 30 days for all other weeks. 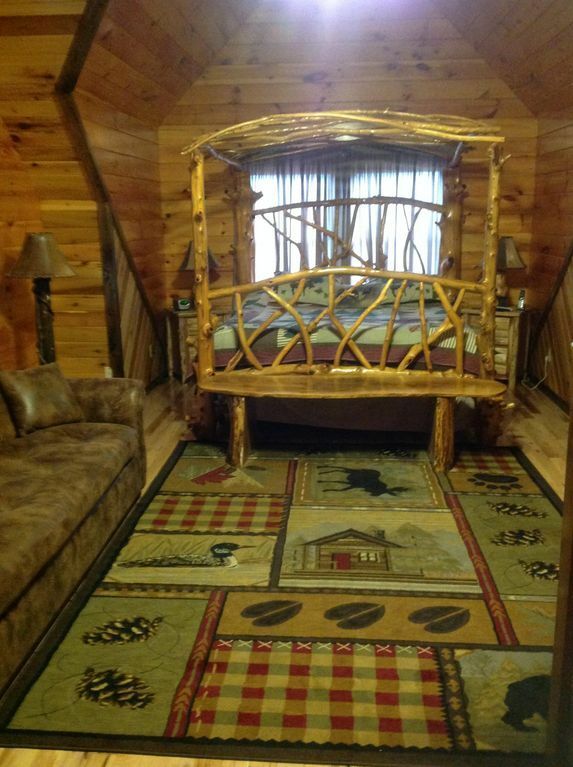 Sleeps 16, add $10.00 per night per person over 16 people. Please call for approval for more then 16 people no more than 20 guests. 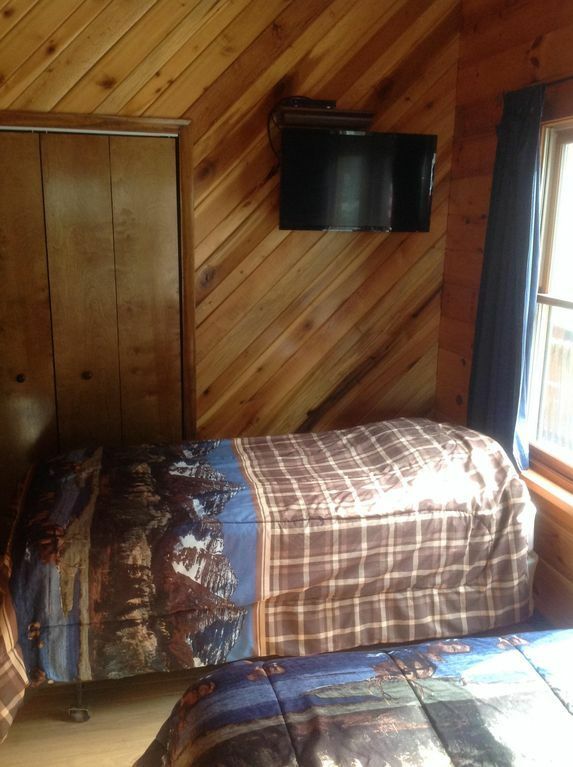 Must be over 34 to rent the cabin. Check in is 4:00 pm and check out is at 10:00 am. We really enjoyed the place..
We had an amazing time at this well-appointed, roomy, comfortable cabin. Everything was amazing. The photos don’t do the place justice. We traveled with three families and five teenagers. There was plenty of room for all 11 of us with a bedroom to spare! Our only issue was there is ZERO WiFi or cell service if you are a Verizon customer. Our friends with AT&T had no issues. We even tried the cabin WiFi. However, this was such a minor thing! 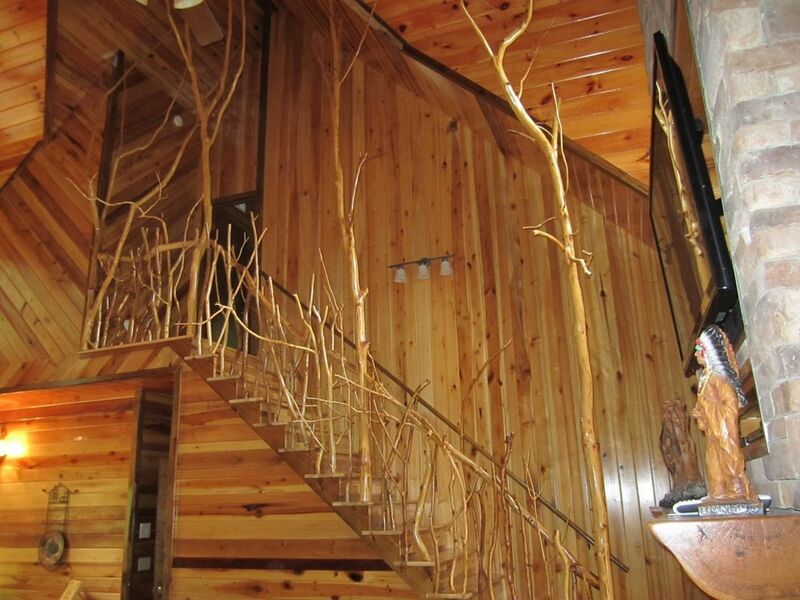 We can’t speak highly enough of this wonderful property. Very beautiful and equipped mr.ted was very infromteal andmy family really love it. 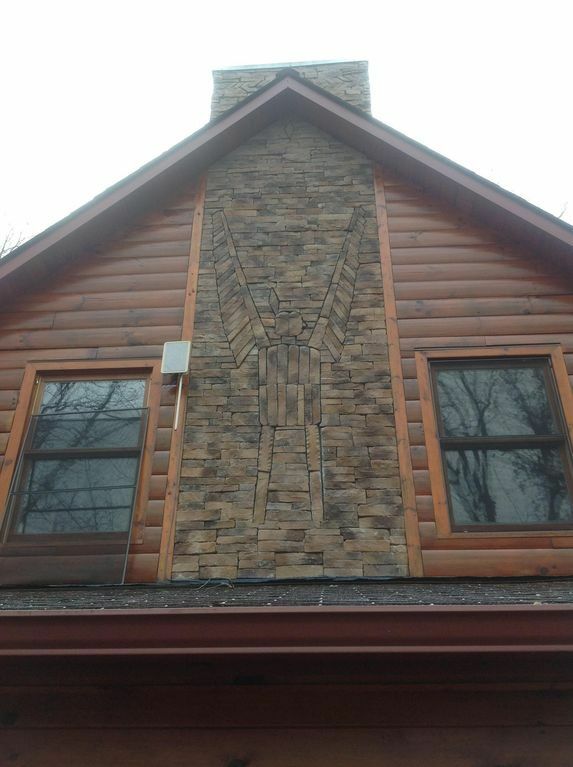 Thank you Ted for sharing this wonderful home! What a beautiful, peaceful, relaxing environment and surroundings! Everything was already thought of. Every concern had a perfect solution. My entire family, age range 15 months to 85 years old traveled from New England, Florida and Maryland for my daughter's wedding in Franklin. Plenty of large gathering areas inside and outside on the expansive decks, as well as room to take space in privacy when needed. I was concerned about access inside and to outside for my elderly parents and also a post-surgery pet but there was ample accommodation for both scenarios. All amenities for infants/toddlers were already available much to relief and gratitude of our youngest parents traveling with their children. A wonderful vacation with lots of fun and memorable moments was shared with family and enjoyed by all! 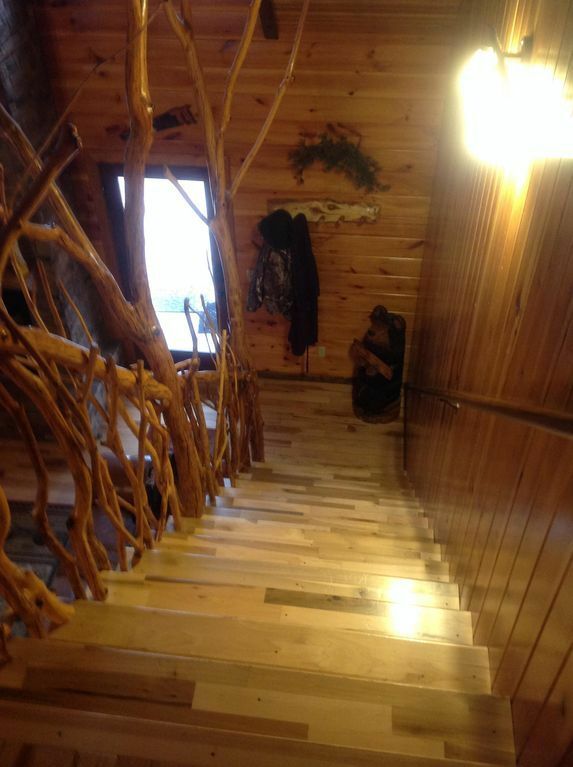 * It should be noted that this is a mountain cabin and accessibility is via a fairly short but rugged and considerably steep incline. That being said, if you have a higher SUV/truck with AWD or 4WD it makes a difference, however we also traveled the terrain in our Nissan Maxima with only minor issues in a couple of sections. 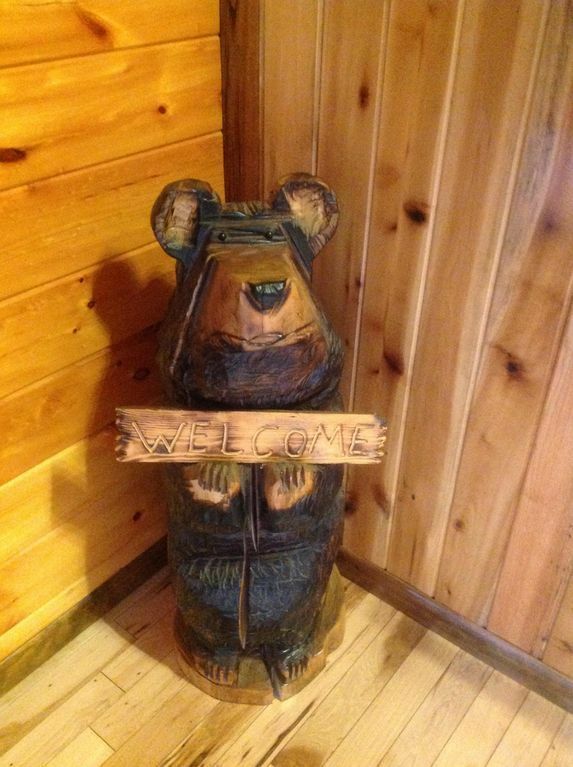 While helpful to keep in mind, this should not deter anyone from considering a stay at this beautifully picturesque and relaxing cabin home! It was definitely worth the adventure! We had a fabulous time! Sincere gratitude, Marlene and 13 family members. We had a great time in this roomy house, despite a lot of rain that week. 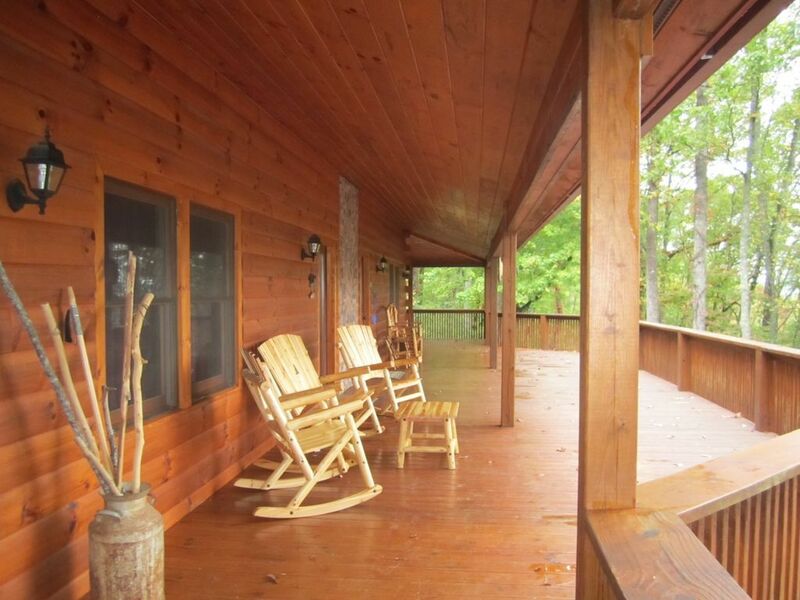 The huge porch has a generous roof to be able to sit, relax and enjoy the view, rain or not. There were 15 of us, ages 9 months - 85 years, and 2 dogs and plenty of room for everyone! Expect to do some driving to get to town, hiking trails, pontoon boating on Lake Glenville, the Biltmore, etc., but the area is beautiful. Beautiful view, amazing amount of space, can we say AWSOME! We had a family reunion at the house. There were 11 of us in the house from 5 different households. 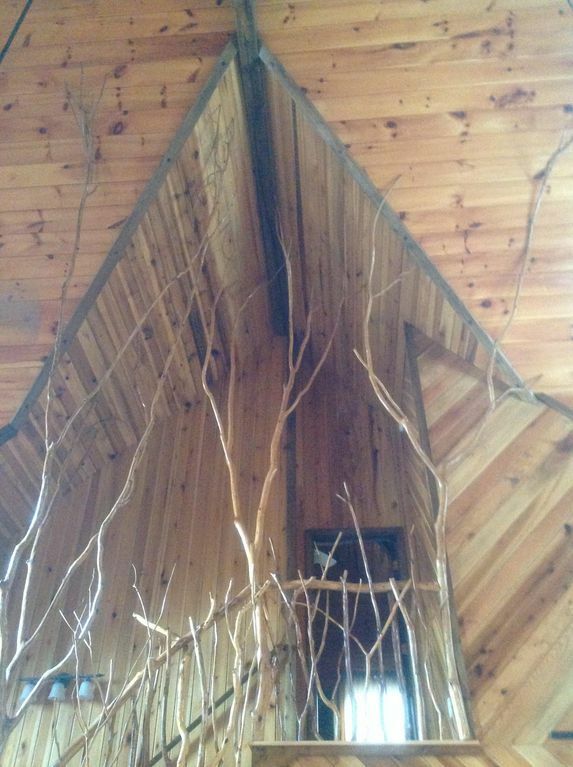 The house was absolutely PERFECT! It provided the perfect setting for when we all wanted to be all together but was big enough to spread out to do our own things too. 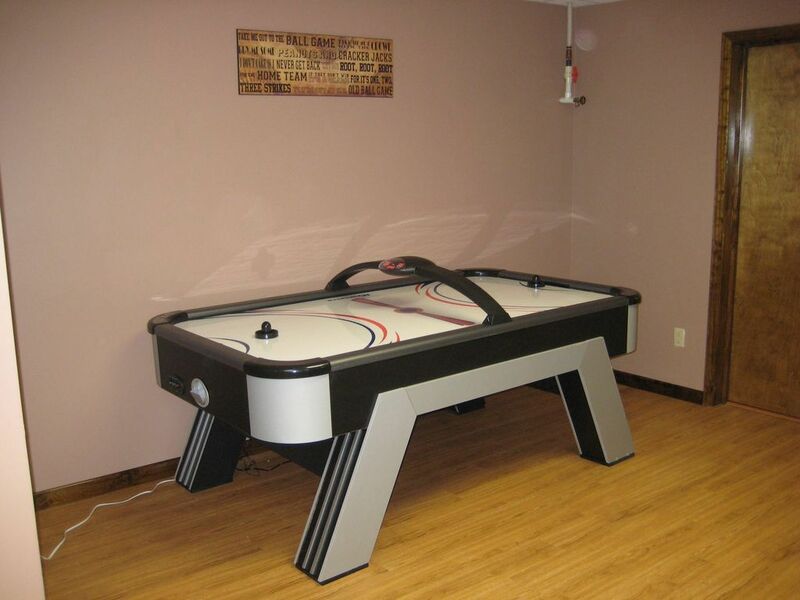 A perfect example was one day, the kids played in the basement filled with a pool table, arcade game, air hockey. etc., on the main floor, a few men watched a golf match, my husband relaxed upstairs in one of the master suites and my mom, sister and I rocked out on the porch. The house had everything we needed from linens, toilet paper to pans to cook for large groups. 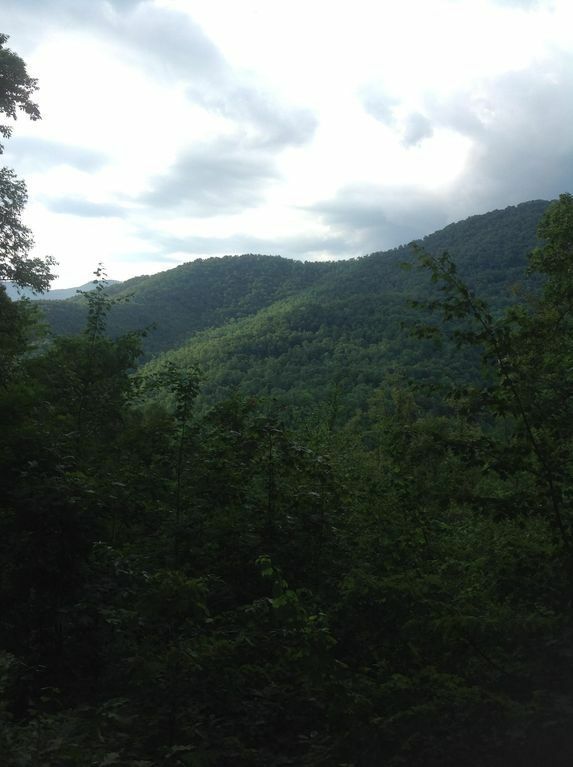 As for things to do, there is tubing, gem mining and hiking near the house. If you are willing to drive 30-45 minutes, there is white water rafting at NOC, horseback riding, more hiking, and exploring Franklin. If you have kids, they will love going to Factory Franklin. We got a group rate at the Factory and spent 6 hours playing unlimited arcade games, riding Go-Karts, bumper cars, laser tag, etc. Three of the adults were over 70 and they had just as much fun as the kids. Also in Franklin, there is the Smokey Mountain Center for the Performing Arts. Check the schedule for shows. My only warning about the house is that the long driveway was steep and mostly dirt and gravel. If you have a 4 wheel drive, bring it, especially if rain or snow is predicted. I hope you enjoy the house as much as we did. 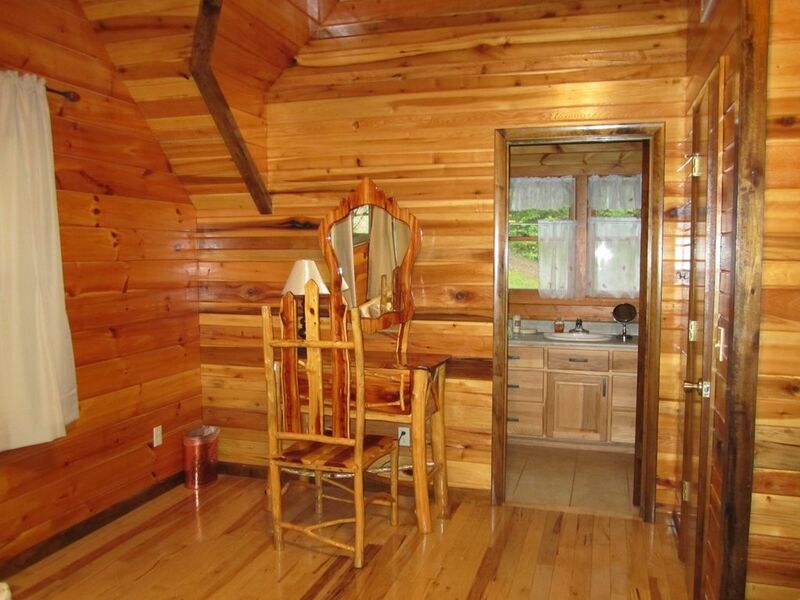 Well furnished, clean, and well maintained. Management / Owner were easy to work with. We could not have asked for better for our event. 5 stars! 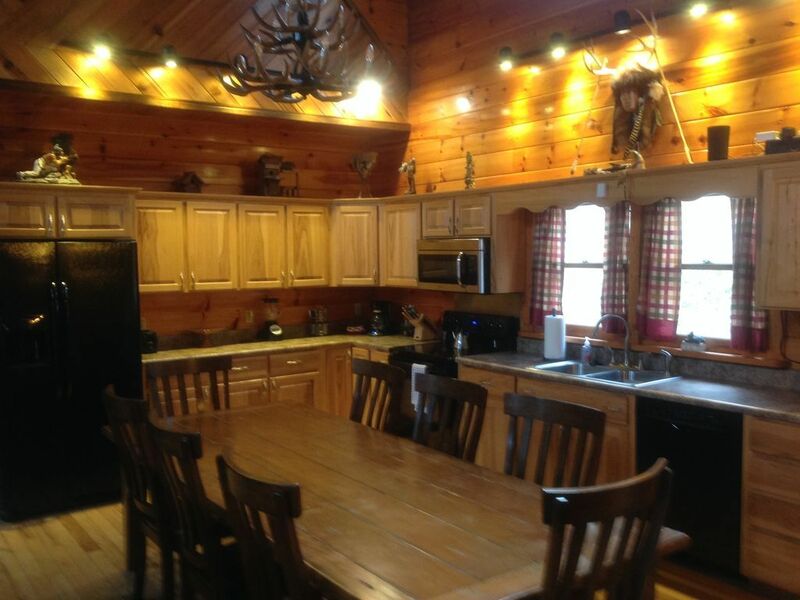 Our group enjoyed the cabin. 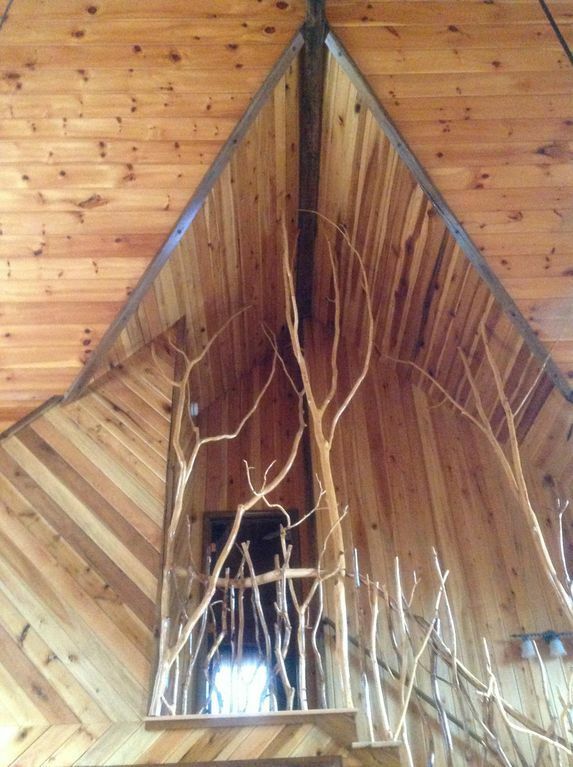 All the things we normally think of in a vacation home are there. 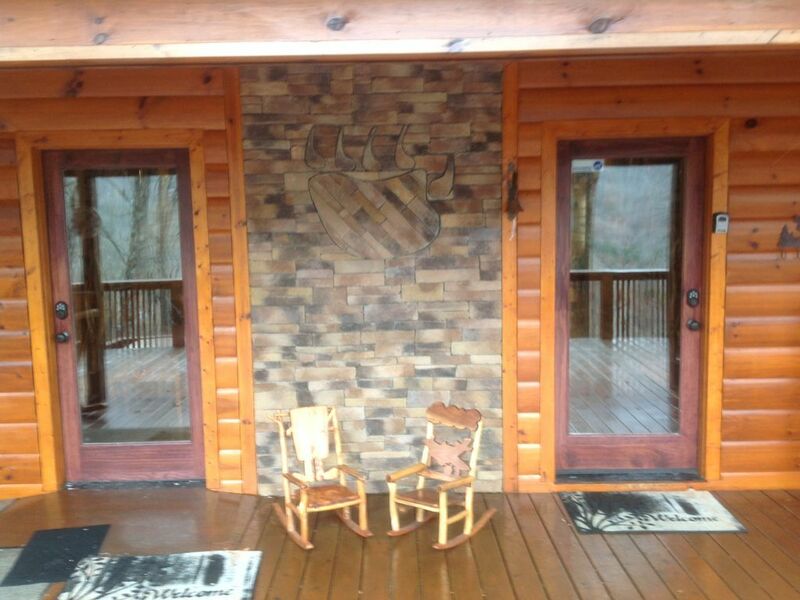 We enjoyed the privacy, the view, the game room, the fire pit, and the hot tub. 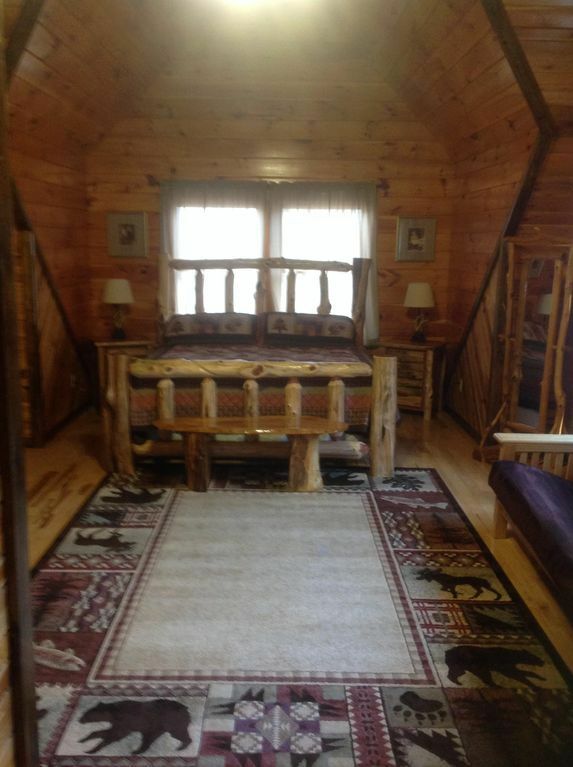 The floor plan is great and the cabin is equipped to handle all ages. 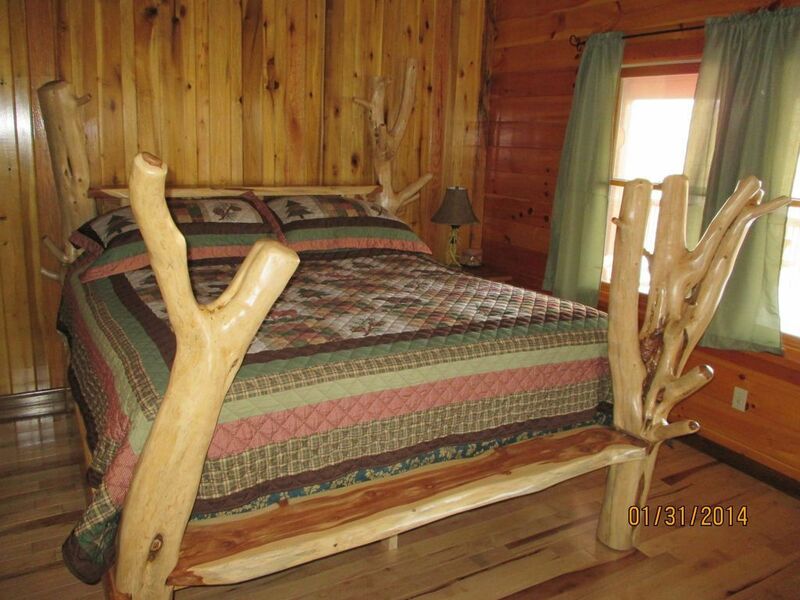 Stayed here with some friends on a motorcycle trip. We've stayed at many places before and this place is top notch. One of the best if not the best overall place we've been to. 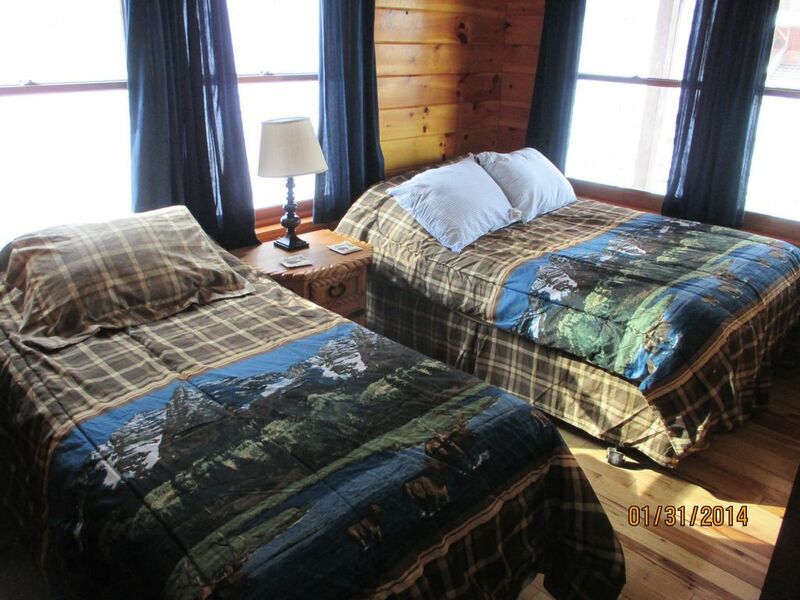 Two really nice matching master bedrooms. 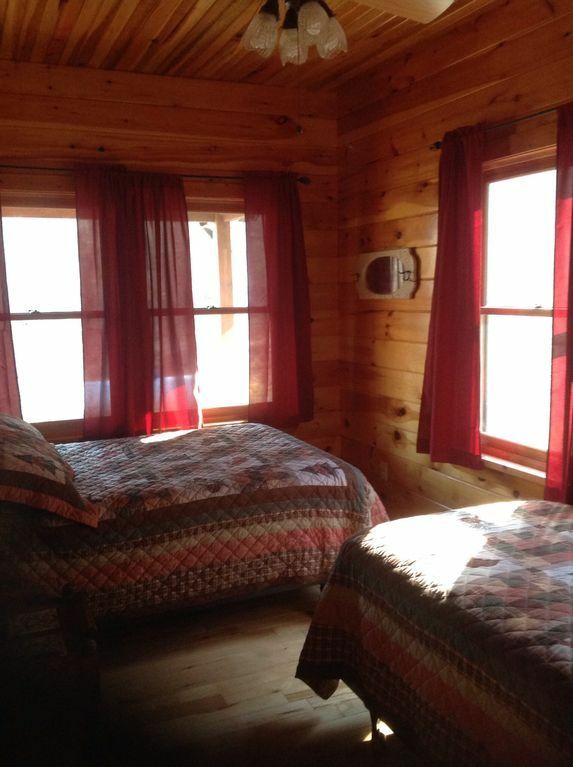 Even the other bedrooms are all very large with nice sized beds and close bathrooms so you don't have to squabble with friends or relatives over who gets the "nice" bedroom. 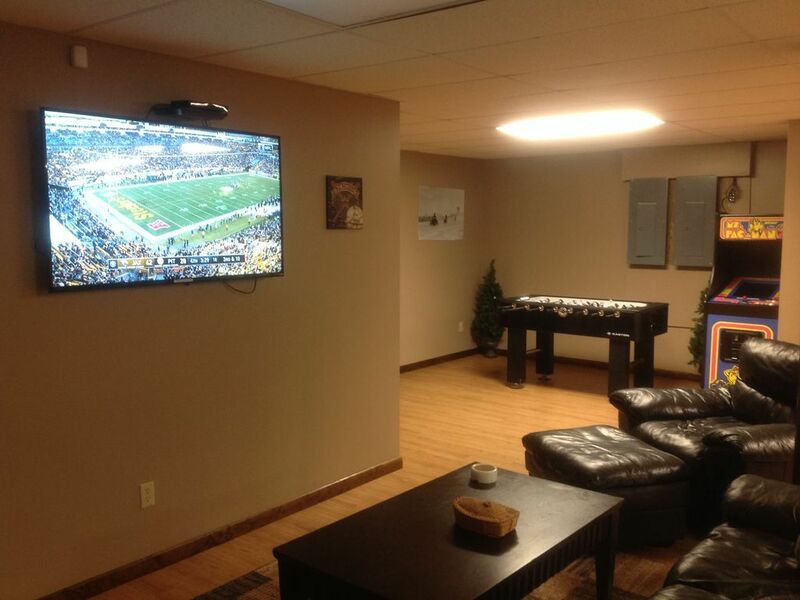 Huge basement with all kinds of games to play. Huge flat screen TV. We did not have children with us, but I did notice plenty of accommodations for families with little ones. Cribs, high chairs, baby gates, ect all provided. 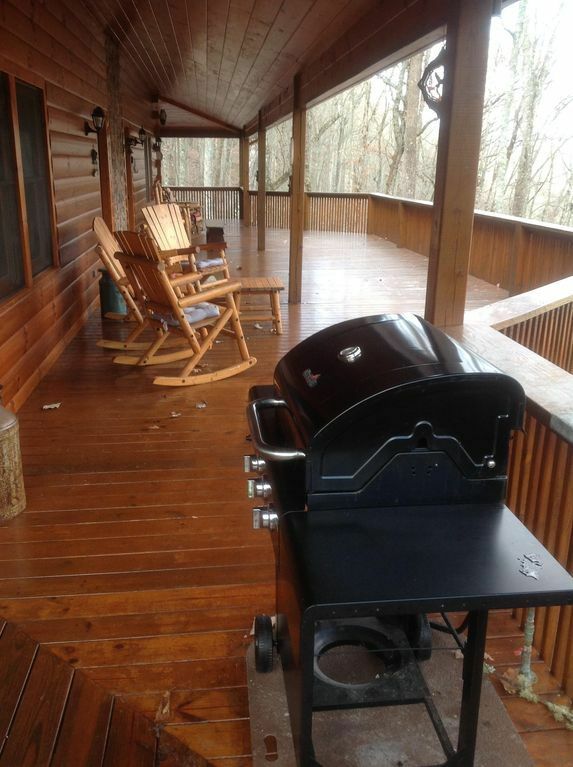 Huge deck with a great view and a gas grill. 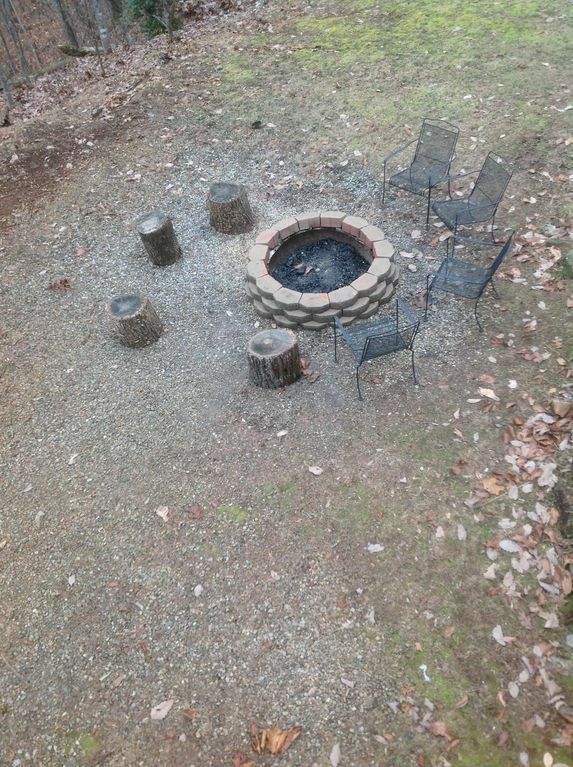 Large firepit. 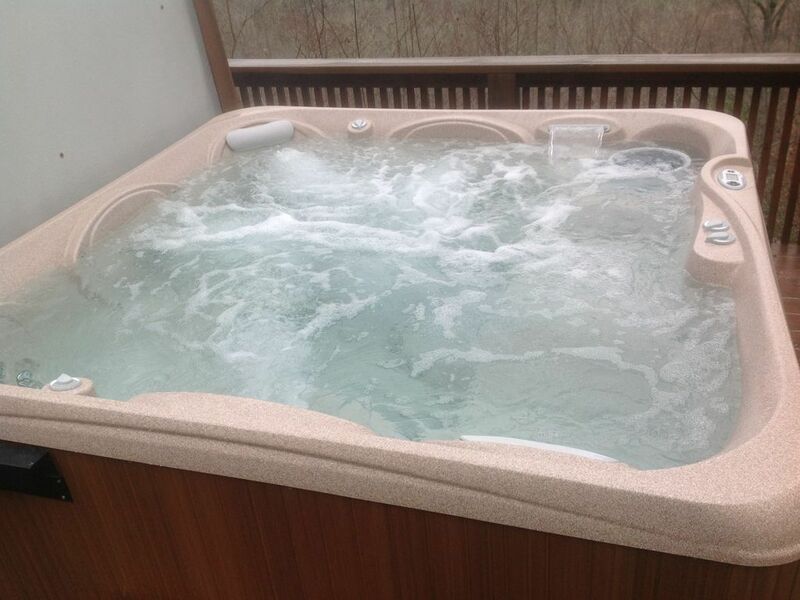 By far the nicest hot tub I've even seen at a rental property. Plenty of pots, pans, Tupperware, ect. Really cant say enough about the overall facility. 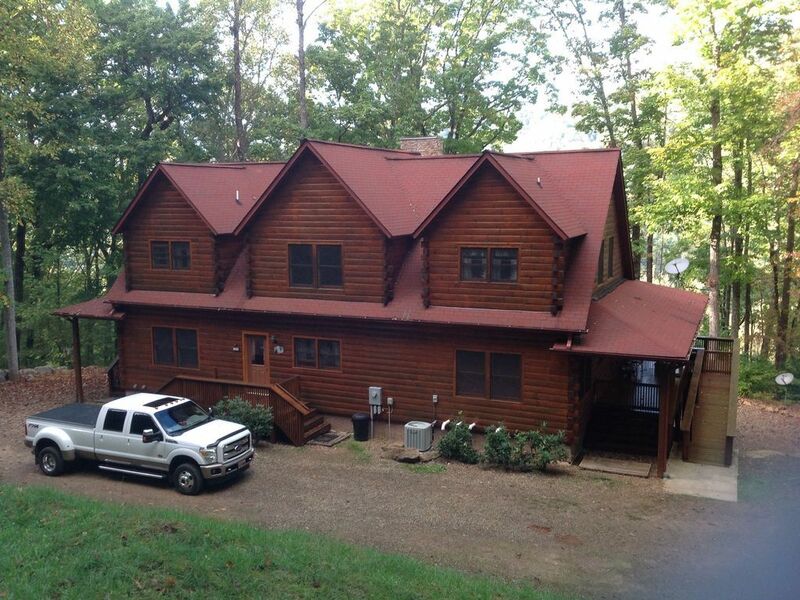 Owner was very accommodating and follow up was great. Even got a visit from the cleaning lady to make sure we were good. 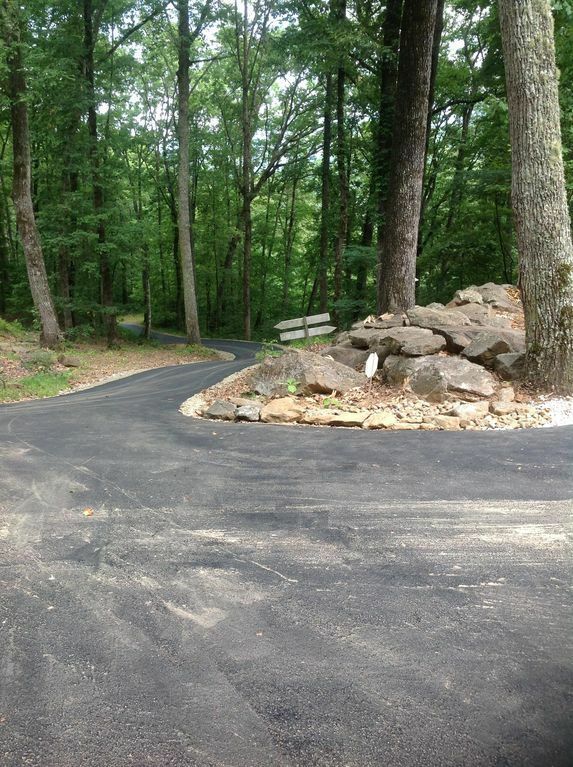 The driveway is steep, but we rode up and down it a bunch going on rides and had no issues. 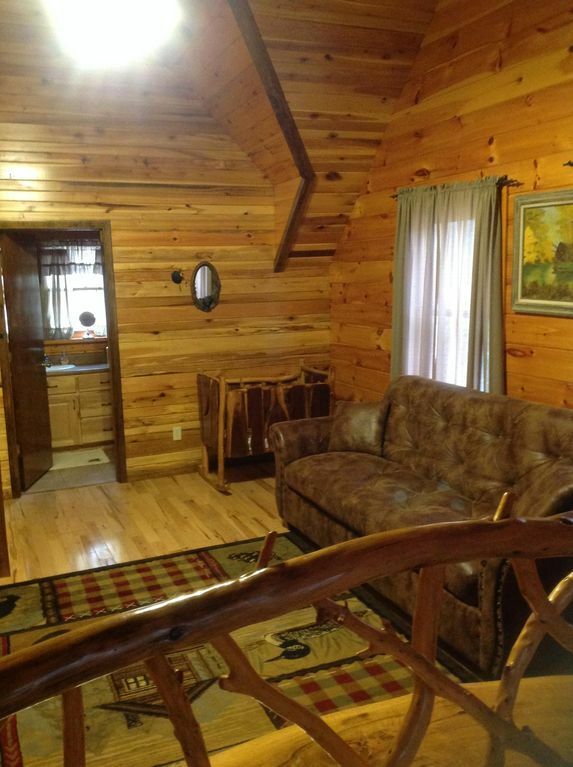 I could see how a lesser experienced rider might be a little tentative, but if you want a cabin with nice mountain views you're going to have to go up some steep driveways to get there. Non issue in a car or truck. 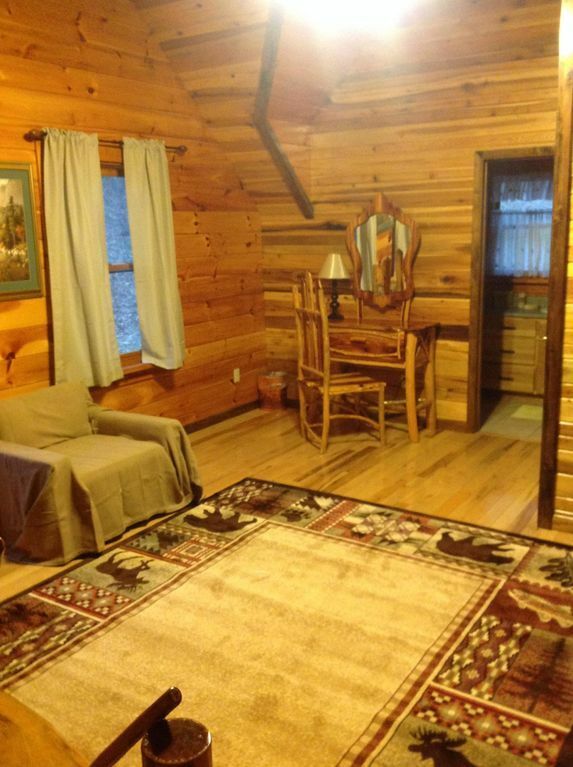 A great cabin, you will not be disappointed. The property delivered on everything it promised! 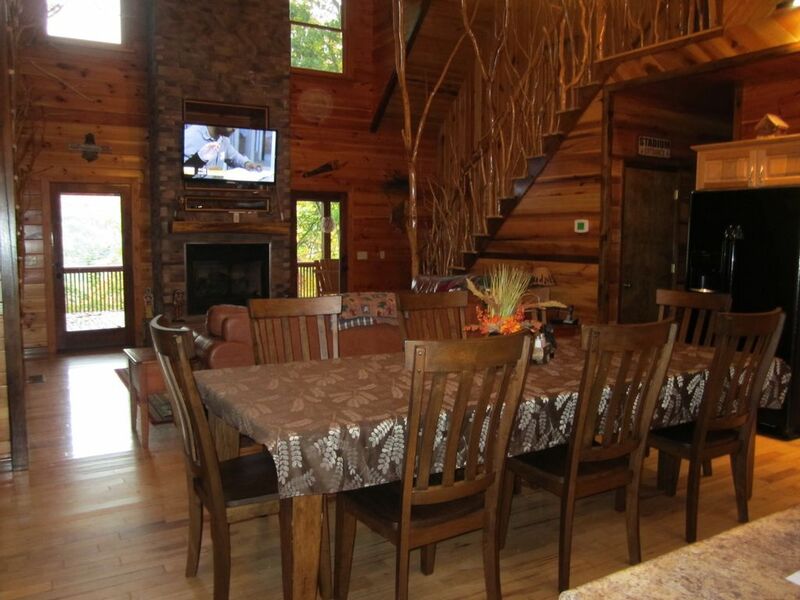 If you are looking for a secluded getaway in the gorgeous Smoky Mountains with an upscale feel, but down home atmosphere, then this is your place. From the minute we drove up the mountain road, we knew we were going to be in love. 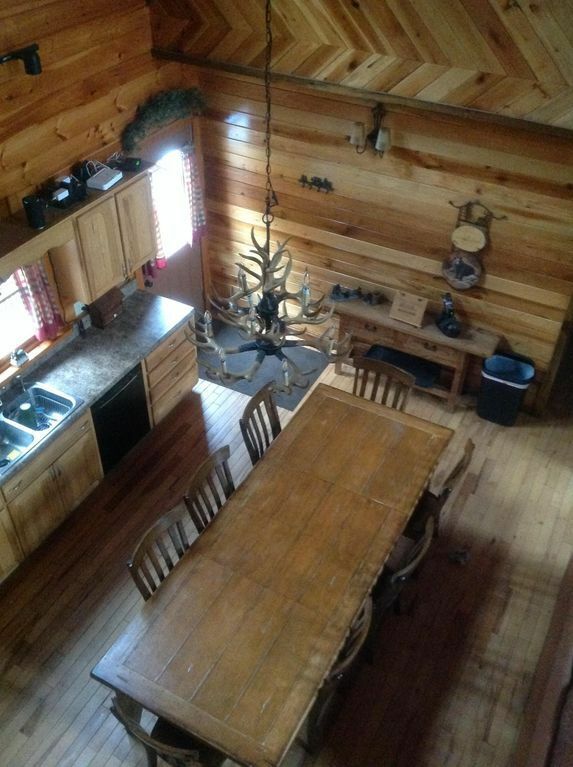 With three floors there is enough room to sit around the table and be together as a family or all go your separate ways and pretend you have the house to yourself. 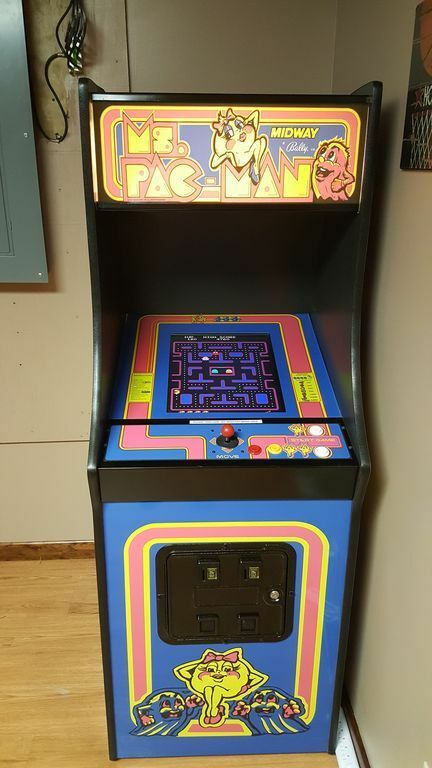 The fireplace, the enormous deck, the spacious kitchen, the furnished basement with pool table, arcade games and so much more made this the perfect place to celebrate our dad’s 80th birthday. Not to mention seven bedrooms and 5 bathrooms! The view out into the mountains are awesome for a morning cup of coffee. Or maybe you would prefer an even fire in the pit to make s’mores. We did it all. To top it all off, if you start feeling too rural, you can be in the middle of town in 15 minutes. This was our first time to Franklin and Archer’s Lair. I can guarantee you it won’t be our last. (P.S. use your time to unwind and unplug. Although there is internet service is very slow, which I suspect is due to being in the mountains. Take it from me, unplugging wasn’t a negative!). 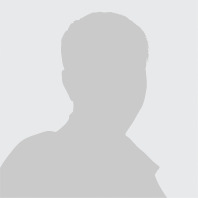 Theodore Schropp 3212984856 Show Phone No.